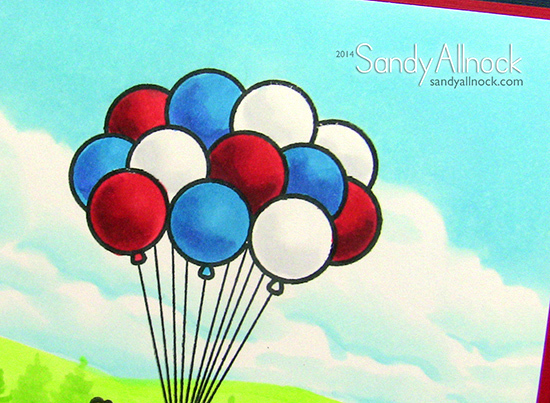 I love how the balloons have the little highlights on the left….looks pretty realistic, doesn’t it? I think I’ll be back a little later today with another bit of news…need to confirm it before linking you up…Stay tuned! 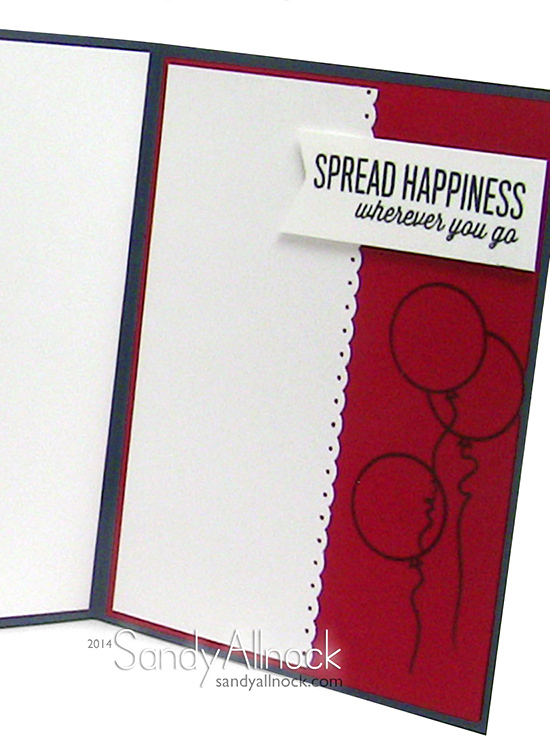 I loved how you did the clouds and the rest of the background and since I have that stamp set, I’m definitely going to try it. Thanks for the inspiration!! I love all of your backgrounds in whatever mediums you use, by the way. Oh my gosh, Sandy, I LOVE how you did the clouds! At first sight, I thought you used a stencil, but noooo, you hand-colored them. Terrific! I really enjoyed watching how you did that. I’m new here and am glad I found your blog. Thanks for the inspiration! So beautiful! you make me believe that even ME, a non copic user, could do this! 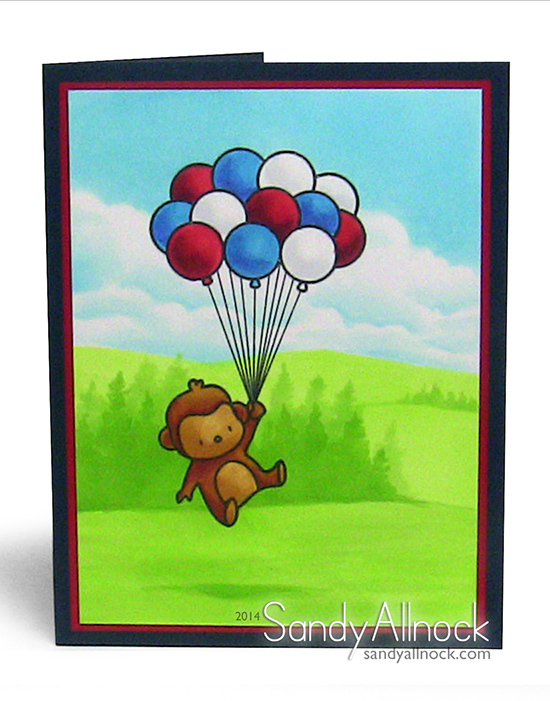 Thanks for the great video…a very cute card! What a great tutorial! you make it all look so simple but I know there is a learning curve! By the way, what type of paper do you use for the Copics? Thanks! I always learn something new watching your videos, Sandy! Don’t have the funds yet to purchase copics. Have been tempted to buy cheaper ones, but afraid I won’t be happy with their performance. In the meantime, just storing all the info you share in my brain for that “someday”. Thanks for all you do and share Sandy. Fabulous video tutorial Sandy. I like seeing both techniques – but I don’t own the airbrush equipment as yet. Cute card and great video. Love all the details you did and I like seeing both ways. Thanks for sharing. Love you videos of the balloons and monkey. I want to become a patreon as soon I get back from taking my mom on a trip. Probably aound beginning of AUgust. Met you in Cols and that was really special. I watch all your videos and read all your posts, even though I don’t take time to comment on each one. I love your work!!! This is fabulous! Thank you for making this tutorial! Wow. Your coloring is AMAZING!!! Thank you so much for sharing this video!! The cloud background is absolutely stunning!